When designing new products or digging into the hazard data associated with materials from different suppliers, a comparison of inventory information can help show you where one product stands out, for better or worse. Toxnot Team users can create comparisons of two products or materials on-the-fly, export the raw substance and material data, and save the result to check out again later. You can also share meaningful inventory comparisons with other members of your team. To create a comparison go to your Materials or Products library, select two inventories, and click Compare. 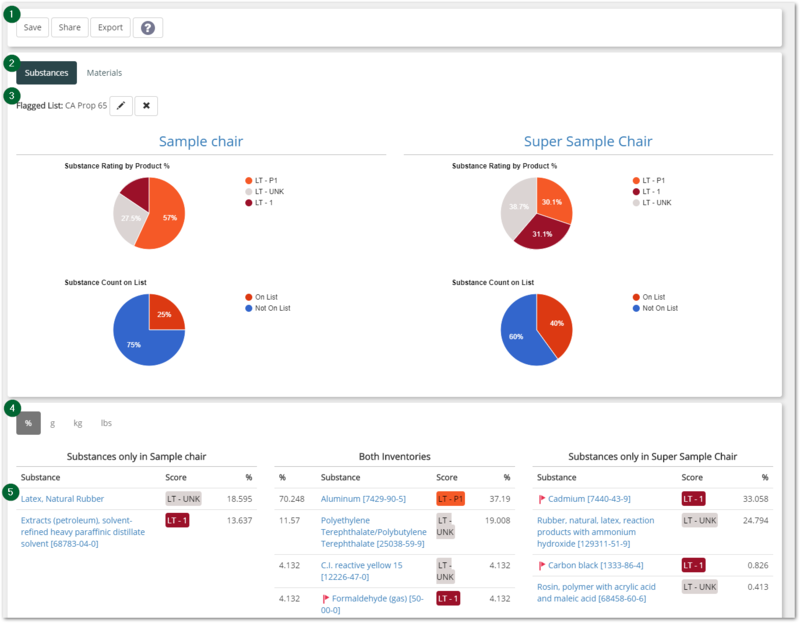 The top section of your new comparison is a collection of charts summarizing Product % by LT Score and List Memberships for the substances and linked materials within your inventories. The bottom section of the comparison is a differential of the substances and linked materials where you can dig further into which substances and materials are responsible for the scores you see. Save a comparison, Share a comparison with a member of your team, or Export the results of your comparison. Toggle between a summary of Substances or Linked Materials in your inventories. Select a Regulatory, Restricted, or My List against which to flag substances and materials in your inventories. Toggle between percentage and weights in the differential table. Click any product, material, or substance name to open a new tab to the BOM Editor or Substance Details. By clicking Save, you will save the comparison relationship to be viewed again at a later time. You can view your own and your team's saved comparisons at any time by clicking Design Tools in the navigation sidebar. By clicking Share, you can send a link to your comparison to a member of your team by email, and include a custom message for your colleague. Sharing comparisons is a great way to spread the word on beneficial substitutions or inventories needing more attention. Sharing a comparison will automatically save the comparison, and you will be able to revisit it at any time by clicking Design Tools in the navigation sidebar. If you want to dig further into your comparison or create your own graphs, click Export to generate a .csv file containing the raw summary data of the comparison.